A professional mic at an amateur price. An extremely high-quality, well-built mic that's ideal for podcasters, streamers, and amateur musicians alike. 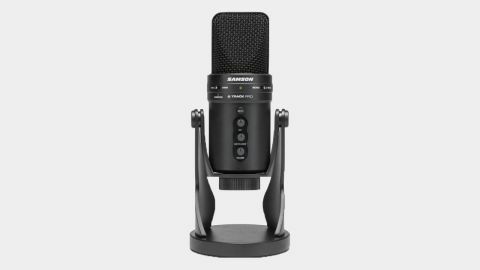 Among the best microphones for streaming there's a growing field of high quality USB condenser mics (offerings like Blue's Yeti and Razer's Seiren) aimed at gamers and streamers that are looking for amazing sound but don't want to spend studio mic money. With the burgeoning popularity of amateur streaming and podcasting, there's an increasingly high demand for audio solutions that provide broadcast quality sound but don't require the budget of a professional studio or network. Into this increasingly crowded market, enter Samson's G-track Pro, a side-address condenser microphone with an impressive suite of options that outpaces the competition. The G-Track Pro offers three polar patterns for recording audio from various angles - cardioid for recording directly in front of the mic, bidirectional for front and rear recording, and an omnidirectional setting for recording a room. The cardioid setting will get the most play for streamers or gamers looking for a high quality replacement for their headphone or laptop mic, but for podcasting and music recording the bi and omnidirectional options are very welcome. The G-Track also exhibits a very low noise floor, meaning there's virtually no perceptible circuit noise from the unit itself. In testing I tried typing while recording vocals in cardioid, and the keystrokes, even with the keyboard positioned almost directly under the mic, were very muted. There's also almost no unwanted noise from moving the mic while recording, which can be handy for emergency repositioning in the middle of a session (and it won't kill the ears of your audience if you need to shift the mic around while you're streaming). Most importantly, the sound quality is extremely high. The G-track records at up to 24-bit, 96kHz audio resolution, extremely high fidelity for a mic at this price point (as of this writing you can find it at several retailers for around $100). Even at a distance of four or five feet the G-Track does an admirable job of faithfully recording vocals, and instrument recordings through the 1/4" rear input sound crystal clear. The inclusion of that 1/4" input means that the G-Track also functions as an audio interface and allows you to choose between recording a single mix of both mic and instrument input or recording them individually as discrete tracks. A trio of handy dials on the front of the mic allow you to change the gain on the mic and 1/4" input on the fly and set the volume of a headset plugged into the 1/8" jack on the back. It's also an incredibly well constructed mic. The base and mic chassis are made from die-cast zinc, and you can tell as soon as you pick it up - this is a heavy, very solid mic. It's the kind of mic that feels like dropping it from a second story window would do more damage to the sidewalk than the mic. The dials also feel well-made, with good tension that allows you to precisely adjust levels. Headphones can be easily toggled on and off through the monitor switch on the rear of the mic, and the polar pattern and number of tracks can be cycled through with similar switches on the front. Everything is well placed and intuitive to adjust on the fly, including one of the most useful features for streamers and gamers - a mute button above the dials on the front of the mic. A small LED light cycles from green to yellow when the G-Track is muted, and even flashes red when it detects clipping from excessive input volume. The entire unit feels smartly designed for easy setup and to get out of your way and perform when you're recording or streaming. The only minor issue I encountered during testing was in initial setup. It took unusually long for the PC I tested on to recognize and install the mic (the G-Track Pro is compatible with both PCs and Mac), and even after it was properly installed and configured in the OS the mic exhibited strange behavior, like not recording properly and the clipping light flashing red even with no audio input. These issues cleared up within minutes, however, and it's not entirely clear if they were software based or the fault of the mic. Since those first few minutes, none of those gremlins have resurfaced. The G-Track Pro is unequivocally one of the best USB mics I've tested, outperforming similarly-priced rivals like the Blue Yeti for clarity and performance (there's virtually no lag whatsoever in monitoring with a connected headset). It's a strong new competitor for desktop mics and could even replace higher priced studio microphones for home audio recording. At around $100, it's impossible to find a better value.